As families grow and children get older, there are many activities and functions for each member of the family that makes getting everyone together for fun and togetherness difficult. There are small windows where each member of the family has to spend on relaxation or fun time, and going out and spending some of that time in traffic or waiting in lines is unreasonable. The pace of life today is at warp speed and being able to slow down and spend quality time with the most important people in your life is important for cohesiveness and general sanity. One solution many homeowners are starting to consider is building/incorporating a specialty fun room into their home. This fun room can take on many shapes, sizes, and costs. Each family needs to think about what activities are most important to their family unit and their homes space and budget restrictions to incorporate the most functional room for their family. There are large differences in costs incurred with each fun room. Movie theaters for instance can incorporate very expensive projector machines, plush leather seats, and amenities such as popcorn machines and sound systems that can push the price up quickly. However, you can also incorporate such a movie theater room with a smaller budget. The most important thing is providing every member of your family a comfortable place to sit and watch a movie together. Maximizing your experience is nice, but the most important thing is providing the family unit with something fun to do without spending lots of time or money. Kathy and Leon Osborne of Grand Forks, ND decided they most enjoyed watching movies together and starting planning out their home cinema. “We love movies, but we don’t go to the theater, so this is my dinner and a movie,” Kathy says. The Osborne’s had a good sized budget for their cinema and decided to go all out. The Osborne’s have popcorn machines, 12 extremely plush, reclining, leather chairs, LED lights in the ceiling to make it look like they are sitting outside amongst the stars, and a fully digital system that is programmed through their I-pad. “We wanted the comfort — we wanted chairs that reclined,” Leon says. “We wanted a space where we could be a recluse, retire, and get away from it all.” They can do everything from dimming the lights, picking out movies from their large collection, or adjusting the stars or the functions of the plush chairs. 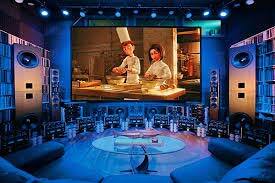 The Osborne’s decided that the sound of the movie was important to them and spent a large chunk of money on a state of the art sound system that incorporated over 700 pounds of speakers and wires. “One of the things we wanted was a room that was about as acoustically well-designed as possible,” Leon says. Leon played on memories from his childhood as well as thinking about how they spend most of their free time. The theater is not just used for movies, but perfect for watching sporting events, or listening to music. Making a specialty room multi-functional is important to getting the most use out of the space as well as increasing resale interest and value. “Besides having a home theater, I wanted the best space possible for high-end audio, so this is a space where we don’t have to be watching a movie,” Leon says. “We can come in here and listen to all forms of music.” The Osborne’s movie theater is an example of all you can do with a large budget, however many homeowners can somewhat cheaply turn an extra bedroom, basement, or loft into a useful movie theater. There are many forms and budgets for specialty rooms, but the most common is a game room for families with multiple children or families who like to entertain and have large groups of people over. Game rooms can be built in many sizes and costs, but most incorporate video games, pool tables, dart boards, family memories, sports mementos, bar space, and comfortable sitting areas. Knowing what each member of your family enjoys and would use most is most important in design and deciding what to put in your family game room. Some enjoy pinball machines, air hockey tables, and other active games. Some enjoy knitting, talking, and watching TV. Some enjoy playing pool or video games. Planning before building is very important in making sure your family spends quality time together and doesn’t get bored of the options available. Game rooms are easily modified and added to, making a revolving fun center for the entire family. If you are a family with smaller children and a smaller budget, try turning a smaller space that is currently underutilized into a small getaway for your kids. Turning a smaller space such as a crawlspace, closet, or nook into a child’s play area can be cost effective and provide endless hours of fun. This space can also easily be reverted back to its original purposes once the child has outgrown the space. Bookshelves, pillow corners, and chalkboards are all inexpensive additions that kids love and would want to spend a lot of their free time enjoying. Whatever your budget or space, start thinking about how your family can spend more quality time together and make a plan as to how you can accomplish that goal. Adults and kids get old quickly and making sure to make memories while time permits is important. Get to it!